Few artists have documented their creative journey from their earliest efforts to their current work. 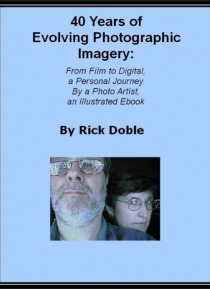 In this eBook Rick Doble shows how his work evolved from his first black & white film photos to the experimental digital photographs that he exhibits worldwide today. Covering 40 years and containing over 100 photographs and also a condensed but complete autobiography, he shows how one artist's th… oughts, vision and imagery developed over time. A useful eBook for inspiring artists and also useful for students in media, this eBook is one of a kind.